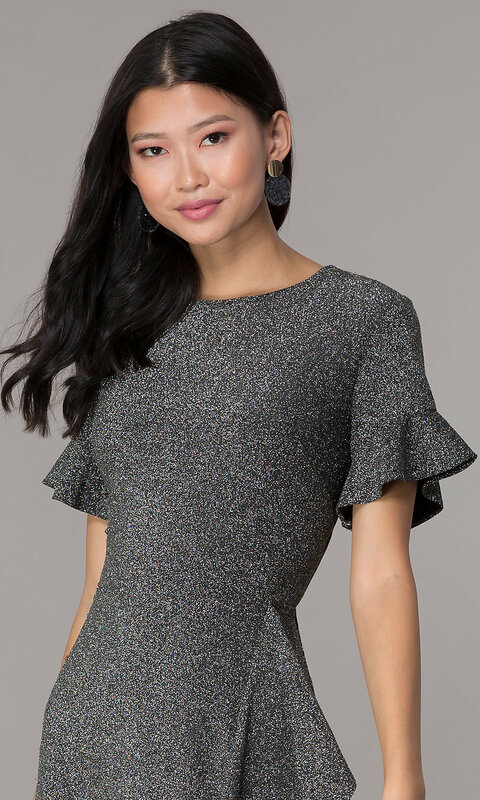 This short-sleeve holiday dress, in a sparkling glitter knit, has a short, fun, and flirty flutter-hem skirt. The adorable silver party dress shimmers from the high neckline down to the hem in metallic silver glitter knit. Short flutter sleeves add to the whimsical design of the a-line party dress. The mock-wrap skirt provides additional charm with the ruffled drape that flutters from the waist to the ruffled hemline. Slip into this silver glitter holiday party dress and shine at festive dinners, New Year's Eve celebrations, or other seasonal parties.